New home, new interior adventures! It’s been a long hunt for our new Chicago home but we are in! Still in total overwhelm, but also giddy with all the projects plans that we have on the brain. I have stored up so many ideas that I’ve been dying to test out. The first thing to tackle was a small quest room, mainly because it was painted a bright blue that had to go. 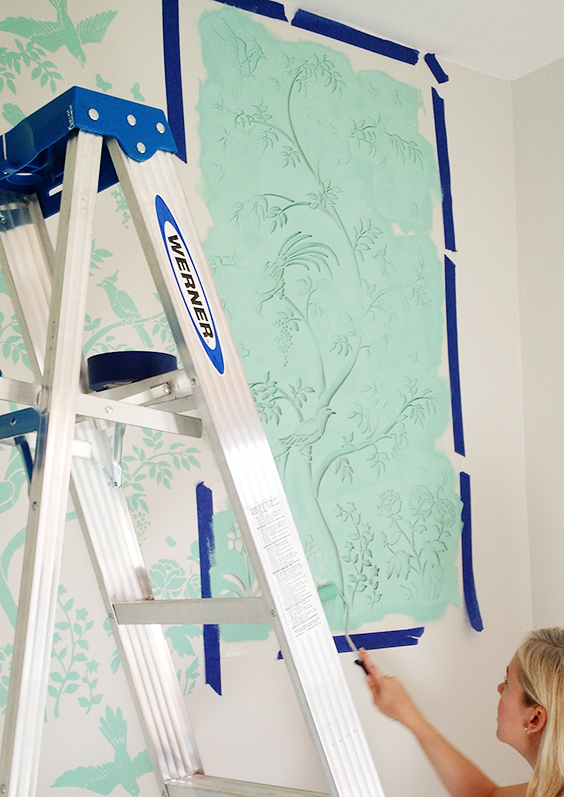 It is a small room so a great place for a fun accent wall. One thing I’ve always loved is a chinoiserie pattern – so traditional, and yet with the right mix of furniture can be really chic, too. 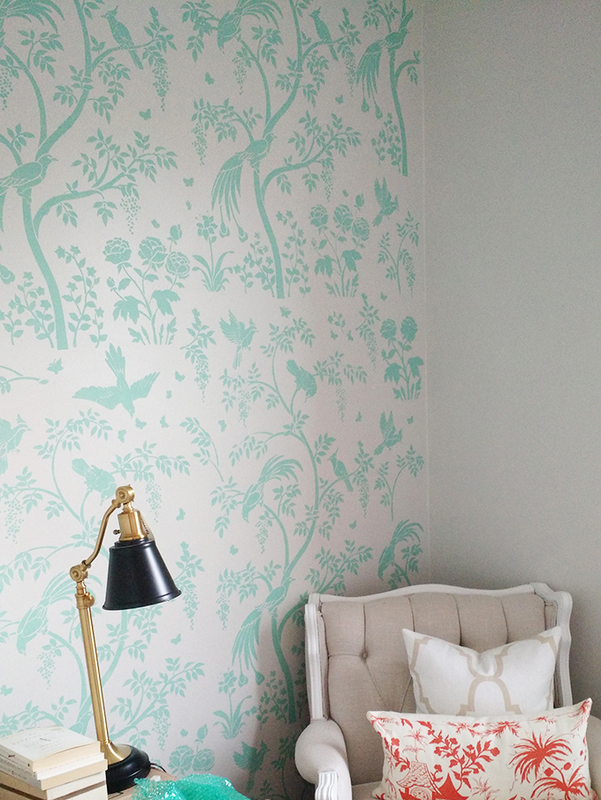 Our guest room was screaming for an accent wall, and while this pattern looks amazing as wallpaper, the hubs was a little fearful of the permanent nature! 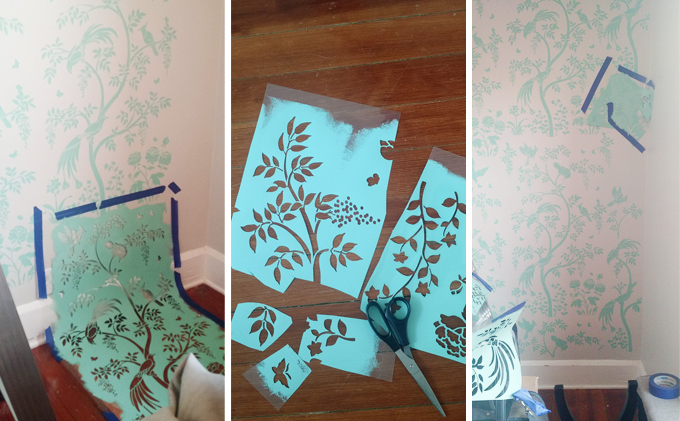 When I stumbled upon Cutting Edge Stencils I was fascinated. 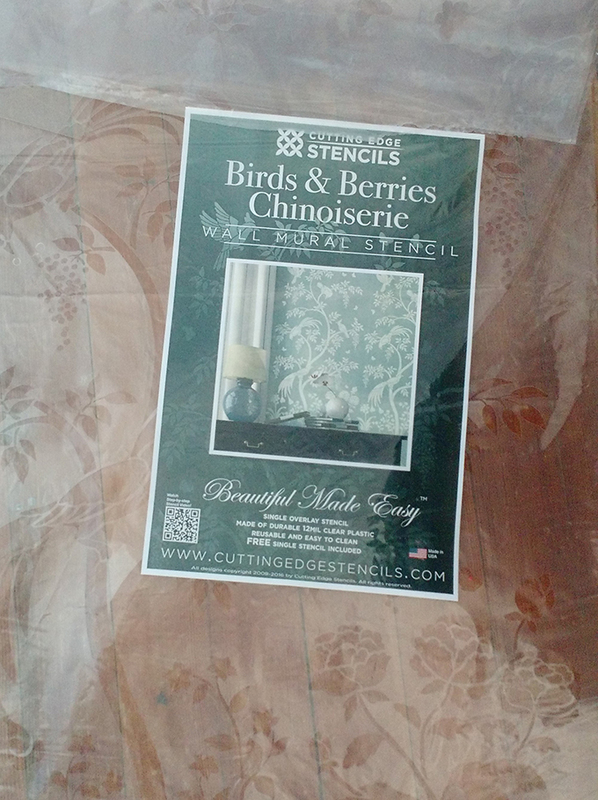 They have so many stenciling options, but when I saw the Birds and Berries pattern I immediately wanted to give it a try. It just captured that look I loved so much. 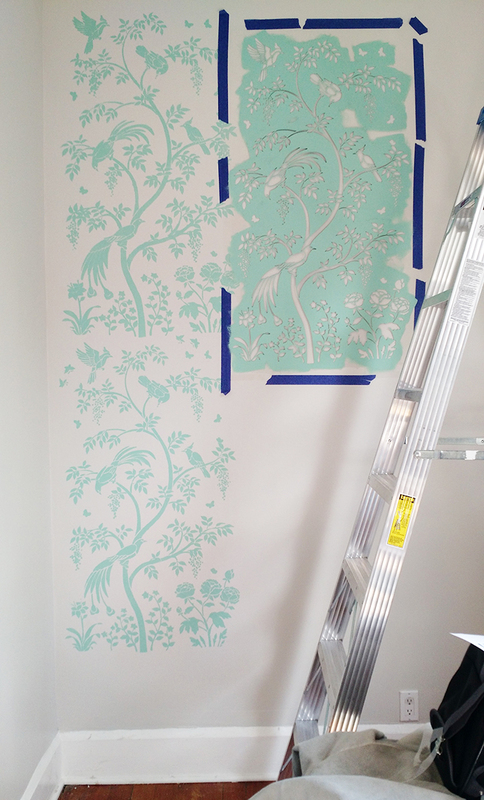 The walls were already prepped with a light grey, so we sampled a few aqua-greens and chose Key Largo Green by Benjamin Moore for the stencil. I wanted contrast so make sure the efforts stood out! Tip from a First-Timer: This was a total accident but choosing a tiny wall and a LARGE stencil was a great first experience. 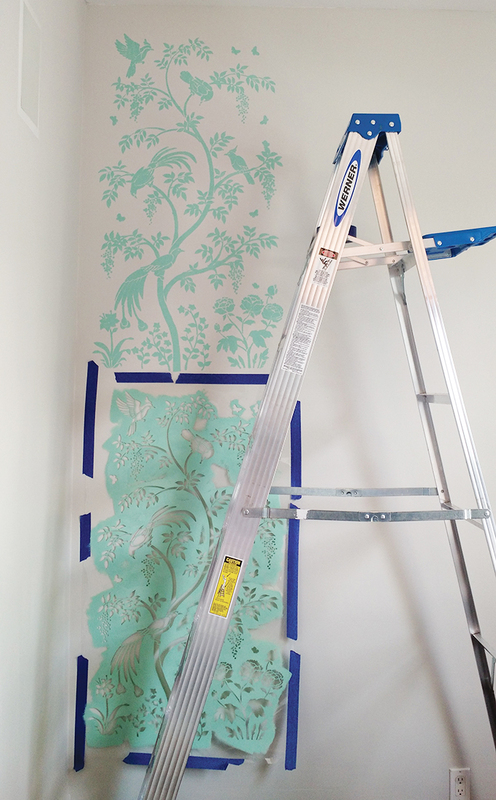 I also did not measure the whole thing out, which you would want to do… I was so eager that I roughly envisioned I could fit about two rows and repeat the stencil three times across the wall. I later found out this would cause a little trickiness at the other side but that came later. They provide great directions, and blue painters tape works well. In fact, it peeled off the wall so in tact, I was able to just re-stick it using the same pieces throughout. This pattern was very forgiving, so I did not use the level after the first one but again winged it – sense a theme? I dropped the next column down a bit thinking it would blend better. More structured patterns you would have to perfectly line up. I began with a stenciling brush but the small berries were taking forever so I quickly moved on to a small roller to speed up the process. I could have stopped to clean the stencil mid-process, but instead I pushed through. Due to this I had a little residue and a bit of squishing behind the stencil which left the edges a little less than crisp towards the end, but that’s what the uniqueness of making it your home is all about right? Then, for stitching it together and the ‘holes’ in the pattern. Since I staggered the pieces a bit, I needed to fill in what I could at the bottoms (like bending it on the floor). 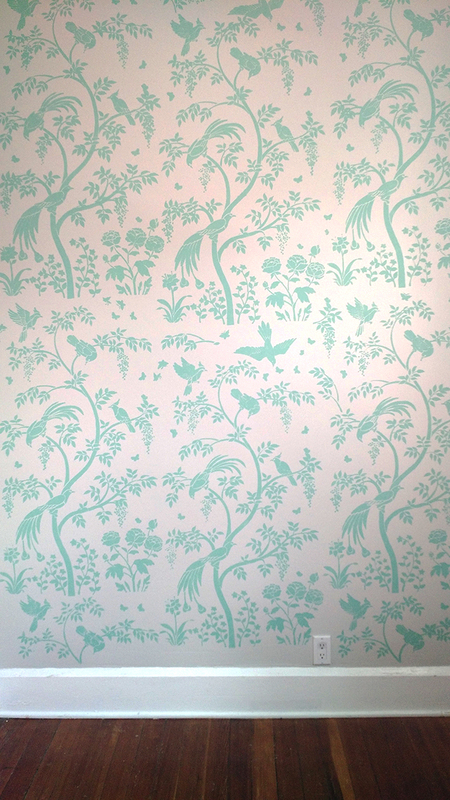 And lastly, I decided to chop it up (sigh) and use my favorite parts of the design to stand back and eyeball where we could pop in little birds and vines to make it click together. The stencils are technically reusable, so you might not want to go that route, but it definitely was easy to work with once you had little snippets. They were kind enough to include some smaller extras as well. Step back a lot and squint your eyes to see where it needs one here and there! Overall, still in shock by how fast it was, and slightly obsessed with the outcome. The fact that it is paint and can be swiped over if we tire of it is such a bonus. The rest of the room is still full of boxes but until it’s styled it’s making us happy peering around the corner and looking at our birds. Don’t imagine getting sick of it anytime soon…and scheming what else I can stencil….